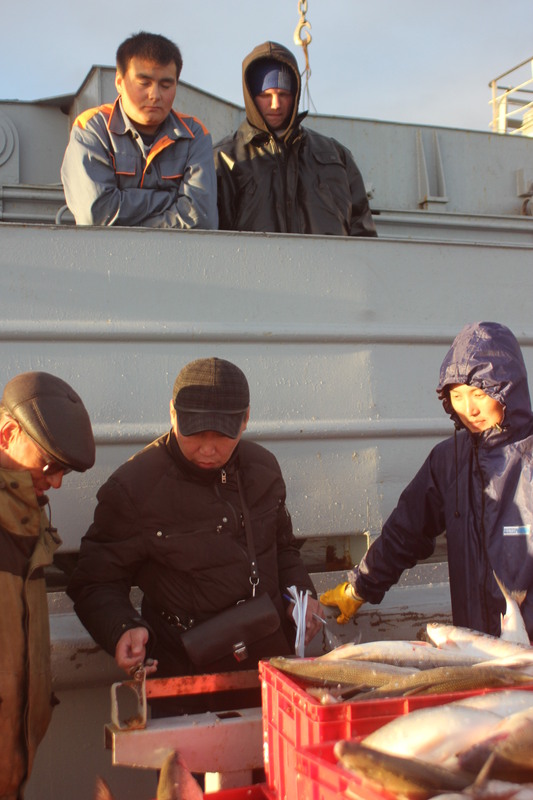 From Tiksi you go another 50 km by motor boat to the village of Cape Bykov (Bykov Mys), where 500 people engage at 72 degrees northern latitude and harsh climate engage in coastal fishing all over the Lena River Delta. 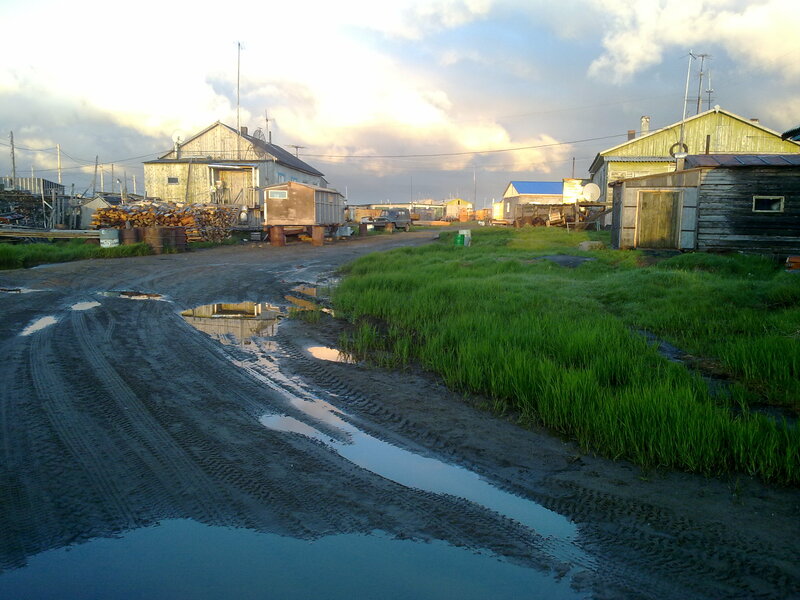 Today the only still remaining proper kolkhoz (cooperative enterprise) in the Sakha Republic (Yakutia) is located in Bykov. Surprisingly, during Soviet times this fishing enterprise resisted the institutional transfer to a state enterprise, and during perestroika they also resisted capitalist market privatisation – so they are still called “rybolovetski artel (kolkhoz) Arktika” (fishing artel (cooperative) Arktika). Most employees I have talked to are really proud about having preserved that status: when all the state enterprises (such as the local state fish factory) collapsed and employees were left out in the cold, the kolkhoz survived and people continued to feed themselves with fish and exchanged it for other food and necessary goods when money couldn’t buy much anymore. “We didn’t really notice the rouble inflation of the 1990s, because we had fish, and for fish you could get anything if you knew how”, one of our partners in Bykov expressed it clearly. Arriving to a completely new and unknown place is always exciting for us anthropologists, but also a bit scary. The arrival in the field was anything but simple: first I was supposed to go to another village, called Yukagir, about which nobody knows hardly anything. Five days before I was supposed to go there, a helicopter crashed into a mountain on its way to the North, and among the 20 odd victims several where from Yukagir, among which a mother with a baby who was going back from the hospital home. Quite understandably, the village chief said they wouldn’t like to be busy now with hosting researchers. So last minute we redecided with Anatoly Alexeev from Yakutsk University that I would go to Bykov. There obviously nobody waited for researchers either, and the kolkhoz chief was anything but thrilled by the idea of being responsible for the safety of two researchers (myself and student assistant Vladimir Chuvashov from Yakutsk). Moreover, in Bykov they also had a funeral just the day after our arrival after an unexpected murder. In the village without police, the informal order works perfectly so that they found the murderer immediately and sent him to prison. So we were instructed to not go out too late in the evening, and take good care, warned that no police would be there to call – and anyway there is no proper mobile phone coverage in the village. The chief of the kolkhoz put us up in an empty house where the famous earlier kolkhoz chief Vinokurov had lived. Little inviting but honestly the kolkhoz chief said “the house should be torn down anyway, it’s not good for living anymore, but you can stay there”. “Thanks a lot” I said, and “no worries, we’ll survive there”. In fact it wasn’t that bad. The house had electricity, and an oven. And when we got an axe, we could chop huge chunks of drift wood, some of which half a meter thick, to heat it. Bykov has today officially 517 inhabitants, the majority of which have – like in Tiksi – Sakha, Eveny and Evenki origin. The ethnic topic is really interesting to study here, because there is what they call “putanitsa”, which means confusion. Many, if not most of the people, don’t really know to what ethnic group they belong, and they don’t really care either. Basically there are two meaningful categories of people locally, which are called Russians (anybody who is European looking), and Sakha (anybody who is Asian looking). Only when you start asking in more detail, you get confused looks and at times answers that are hard to make sense of. For example, how does it happen that the father is Sakha, the mother Evenki and their common child becomes Eveny? The reason seems to lie in the ignorance or incomptence of Soviet administrative workers, who registered most Eveny people as Evenki. Anybody who was indigenous was registered as Evenki, told several people. Already back then in the 1950s, the indigenous languages were fading here and could not serve as an identity marker anymore. Moreover, both Evenki and Eveny came to the coast and started fishing – so the livelihood wasn’t much different from neither the Sakha, Russians, Finns or Lithuanians there. When I asked the chairperson of the indigenous peoples in the municipality, she told that people don’t know themselves the different between Evenki and Eveny. She herself is in the process of getting the status of Eveny, while the past decades of her life she used to be just a Russian citizen. Svetlana Anatolievna Donskaia, the leader of a fishing team also said “I am Eveny – probably, or Evenki”. Officially the municipality has the status of a “Evenkiiski natsional’nyi ulus”, while in fact almost all of the indigenous population used to be Eveny and not Evenki. They just got registered as Evenki because the officials didn’t know that there was a difference between these two ethnic groups. Both of them used be called Tungus earlier. I don’t know yet what the academic implications of this could be theoretically, e.g. for debates on indigeneity. But I do think that this example indicates towards the importance of livelihood as a unifying aspect, where exact ethnic identification gets to the backburner. It just got warmed up again after Perestroika when laws were passed that gave certain privileges to indigenous residents, such as free medical treatment and free university education, and is perceived locally as rather artificial. This entry was posted in All, Fieldwork, Indigenous Peoples, Russian North, Theoretical Issues and tagged ethnicity, fishing, indigeneity, Sakha Yakutia. Bookmark the permalink. Do you remember the debate on “tundroviki”? I think this was a quite similar issue not so far away about the indigenous population on the lower Yenissei. I think the theoretical implications would be to take the performative aspects of the ethnic discourse seriously and look at the practices of ethnic labeling by bureaucrats and people themselves. And of course we anthropologists have to be careful not to overestimate the importance of these practices for the people themselves. Other aspects of the construction of the self seem to be much more important for social coherence and distinction. Good parallel, I thought about this too. But then the interesting thing is that there is not really ethnic labelling of the people at all. Rather they draw their sense of pride from their regional identity that overcomes what they call “natsionalizm” that they claim sometimes spills over from central Yakutian Sakha incomers to the North. On this topic, Tanya Argounova’s thesis “scapegoats of nationslizm” is good reading, as well as her article jointly with Julie Cruikshank. While that describes the situation in central Yakutia, this case would be the counter-example. I full agree with your last sentence. A possible article could tease out what these “other of the construction of the self” are that are more important here. Social categories like gender, age, kinship, religion and profession, as well as shared use of ressources like land and animals and symbolic ressources like places of memory and worship are means to construct the self in relation to others. That is nothing new. Thanks for the hint to Tanya’s papers. My wife, Jura Vitkunaite-Reilly, is preparing her great-aunt’s memoirs for publication (a run of 50 – 100 for the local Lithuanian community) – would it be possible to use the photo of Bykov-Mys? Irena Kazalauskaite her sister & Mother were in Siberian exile 1940s – 1970s & spent some years in that cold place. Full acknowledgement would be made. this is great news, and I’m truly happy about your comment here. You can also see the next blog entry about the resettlement stories from Bykov and the area. I am most happy to share all photos of the place with you. I’ve got several 100s. we just have to figure out how to share them. The high quality photos are 25MB each. Maybe send a CD to Australia, or some file share service? Write me an email about that. I wonder if your wife would be happy to send a copy of the published memoirs to the local museum that they established in Bykov Mys some years ago? In which language will the memoirs be written? Are you planning an english, Russian or Sakha translation? The completed book, A Wolf At Our Door, arrived from the printers last Friday. Jura translated her great-aunt’s memoir into English, and strangely enough, we have been asked to consider producing a Lithuanian language version! If a Russian translation could be negotiated as well, that would be wonderful. Please send me [Dr. E. Reilly, Australia c/- tedreilly100@hotmail.com] the postal address of the museum in Bykov Mys as well as your own postal address so I can send a complementary copy to each. These stories are important as testimonies to the truth (i.e., real & not imagined History). I have access to some Russian speakers who can assist in correspondence with the Museum at Bykov Mys.